The child had the 1-Euro-coin in his hand. Thomaz just send energy without even touching. 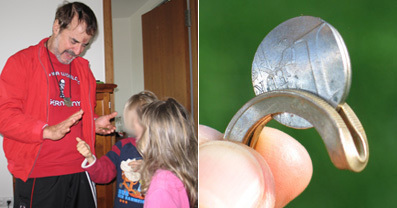 When the boy opened his hand the coin had totally shifted its shape as you can see in the picture. Did you like that and do you want to see more crazy things? The page is only in german, but never mind. Just click on the big image and than on "videos" on the right side. Download some of them. For example the one with the picture of the buddha saying this: "Adler, hier erwecke ich einen Bleikristall-Adler für Sekunden zum Leben. Dies ist ein absolutes PSI-Wunder der Extraklasse." Click on "Video herunterladen" (= download video). You will see a glass eagle sitting beside a real bird and the glass eagle moves its head like the real bird. There is also videos about spoon-bending like Uri Geller and others. 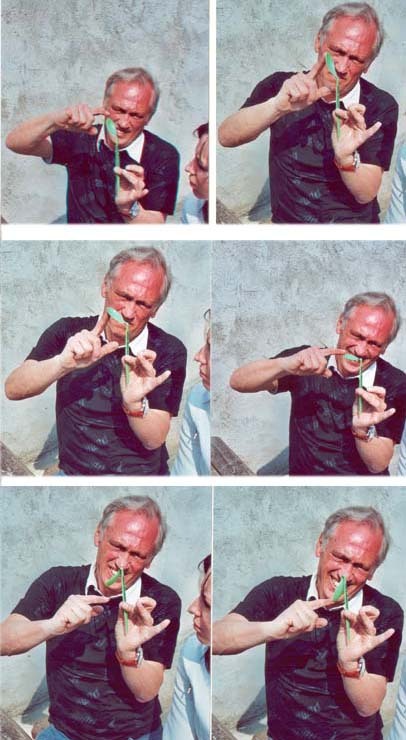 On these pictures you can see him bend a plastic spoon. Click on "Video ansehen" and there you see him bend a plastic spoon. He filmed it with his cell phone camera. What makes me believe, this can be real? A have a very good friend who is a healer also. She can do it too. And sometimes when she is with me it works for me also. I cannot do it without her yet (sniff), but I have had the experience several times what is feels like, when a strong spoon suddenly bends like it was made out of paper. So I just know it is possible.